It would be nice, we thought, to get a few phots with a bit of snow on them. 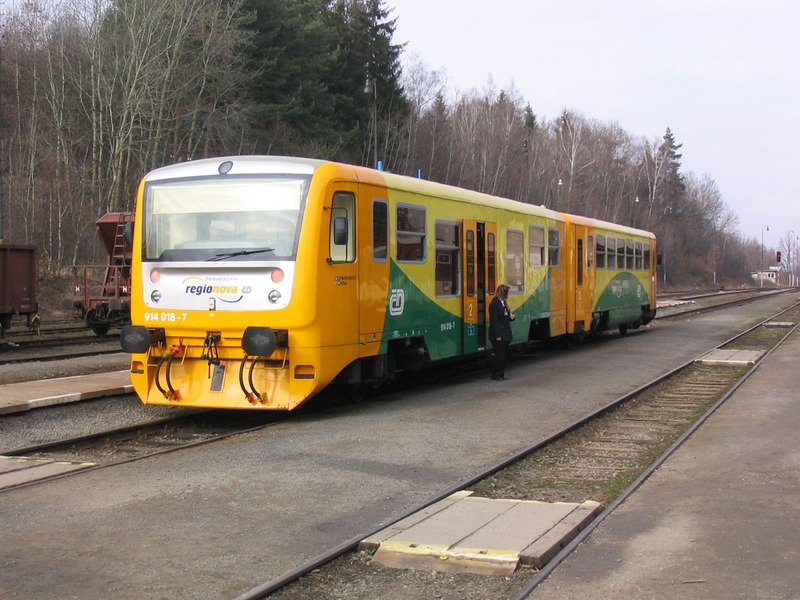 So we picked February for the next venture to the Czech Republic, which was a bit of a mopping up exercise with a particular aim of doing the cross border line to Miedzylesie, due to close for an extended period for electrification. Of course, we reckoned without global warming and saw very little snow! Uneventful journey by car to Purple Parking and their minibus to LHR, arriving in good time for the security stuff (currently all liquids and pastes in containers <= 100ml and in a clear plastic resealable bag, coats off, shoes off, etc., etc.). Inevitably [we were already booked for a late arrival in Praha] the flight, BA858 worked by an A319 ‘miniBus’ was late (‘been running late all day’ quoth the crew). Arrived PRG 2255 (booked 2155) but the G&T was nice! 119 and Metros A & B to the Atlantic – getting the 119 at 2303 off a 2255 arrival was pretty gratifying! The Atlantic, at CZK 1800 for a double thanks to HRS, bless ‘em, is entirely satisfactory even if a midnight can of Pilsner Urquell from the fridge cost a pound [at least 50% over the odds!]. Up betimes for a very decent 0700 breakfast, and away to hlavní nádraží for the 0754 to Bratislava (as you do) with post office liveried 363 127 and a nice air con first. Out via Vršovice and the freight line to Běchovice, all done as booked. 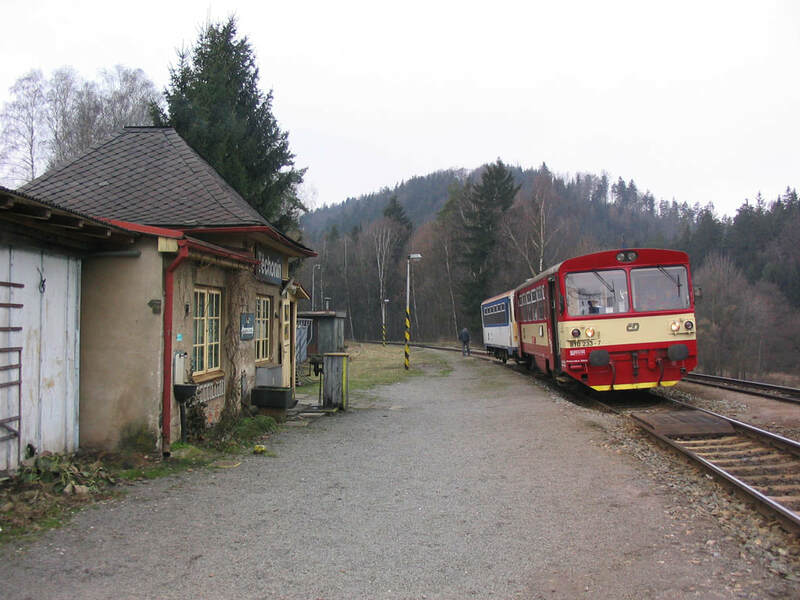 A minor out of course stop before Poříčany was caused by moleworks on the up line just east of the Nymburk line junction. Quite a lot of irritation at Havlíčkův Brod as the wheelie bin arrived round the northern route [we still needed this one]… It took on a full complement of passengers then departed south, reversed into the depot to pick up a trailer, off south again, reversed back to the station to meet its booked departure (late in fact) and finally set off south. Harrumph. 810219 was the ‘box concerned. A wheeliebinfest for a while then with a change at Zdarec (new shiny 814 noted) to 810297, and again at Polička to 810351, wedged with school children. Emergency supplies of Bernard and coffee were obtained at Zdarec; at Polička we had time to step across the road to the nearest licensed premises, which by great good fortune dispensed a range of beers from the local brewery. We had the 11° and very nice it was too. Hideously smoky pub though! R975 (362 173 hauling) craftily came into the platform we weren’t on at Svitavy but luckily PR clocked it and we got there in time. 10 minutes delay ensued at Letovice while we waited for a late running EC ex Budapest to clear single line moleworking. Černá hora, salami sarnies and chips were procured at Skalice, with H’s impromptu chip cones very successful in meeting the requirement for a sharp exit! The sharp exit was wasted as 810 332 had to wait connection and was 6 late away. Still 6 late at the time of writing. The connection just beat us to Chornice, further delaying us on the approach, but the time was regained by Česká Třebová. Kozel (light) was taken in the super-friendly (not) station buff at CT and Kozel (dark) in the buffet car on IC582, hauled by 151 008. The day concluded with Pernstejn 11° and a steak at the brewery tap in Pardubice. Departure before breakfast for the 0656 (Sp 1909, 854 014 and two trailers) to Letohrad. The ‘supermarket’ at Pardubice hl.n. obliged with baguettes and drinks. The connection at Ústí nad Orlicí was suitably done, and by good fortune the connection at Letohrad likewise (with the line from Tyniste) so we were able to bale out and wait in the station buff (coffee/sludge) for 0909 to Miedzylesie. [Due to my fetish for doing contiguous track I’d dragged everybody out of bed early so that we could do the Usti connection on one of the few through trains, and threatened to drag them off to a minor station on the way to Lichkov to get contiguous track at Letohrad! Which was a single compartment second, hauled by 754 050. Out to Miedzylesie without incident. We were able to buy the standard multipurpose cross border ticket back to Lichkov for a princely Zl2 each (35p at a guess). The pub search was fruitless, requiring a 15 minute walk to town only to find two shut pubs (17:00 and 12:00 opening). There was a corner shop near the station however, and Piast from Wrocław was obtained to save us from faintness. Back to Letohrad with 754 050 again (on the Warszawa – Praha, didn’t see the incoming Polish loco) and into the pub across the road for Gambrinus. 810 233 (with a trailer) provided transport to Štíty, gaining our revenge over Maxim Molov (see 4.5.05). The station at Štíty is 1 km or so short of the village so no beer opportunity arose this time. Back at Letohrad (shut for Saturday afternoon) we decamped gratefully from a wedged ‘box into the three coach shuttle to Ústí nad Orlicí, 111 032 leading. 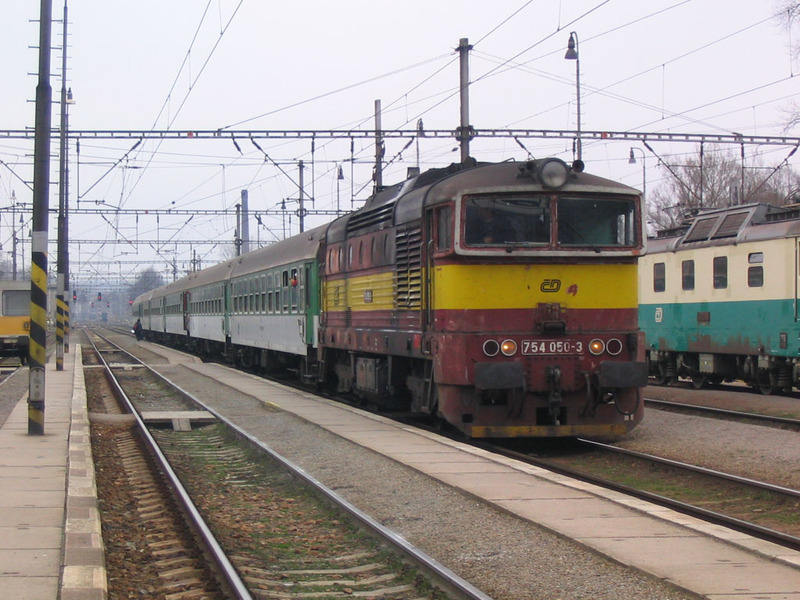 750 365 was noted on Sp 1956, 1536 to Hrádec Kralové, and 111 031 on the incoming service from Ústí. The station buff at Ústí nad Orlicí dispensed Holba (ex Hanušovice) and the bothy outside dispensed mayo’d sarnies. Onwards to Česká Třebová with 163 065 on a local at 1635, thence to Lanškroun on wheelie bin 809 596. With late running (due to R705 ex Cheb) and a 3 minute turnround, there wasn’t much time for a phot (nor much light either) at Lanškroun. The branch got done though, including of course the physical junction at Rudoltice. We had to change there on the way back, with the connecting train already in. 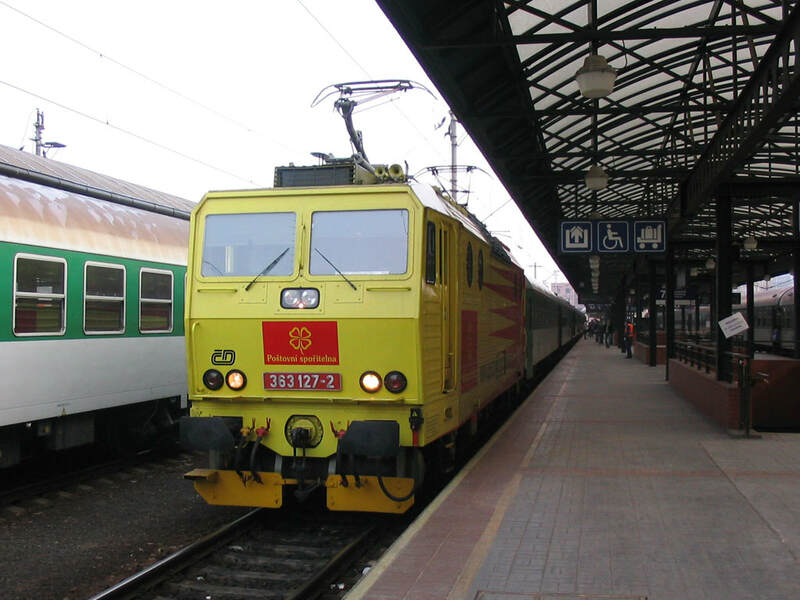 163 089 was the haulage back to Česká Třebová. Final lap was in the buffet car on IC582 again, Gambrinus this time and haulage by 151 027. 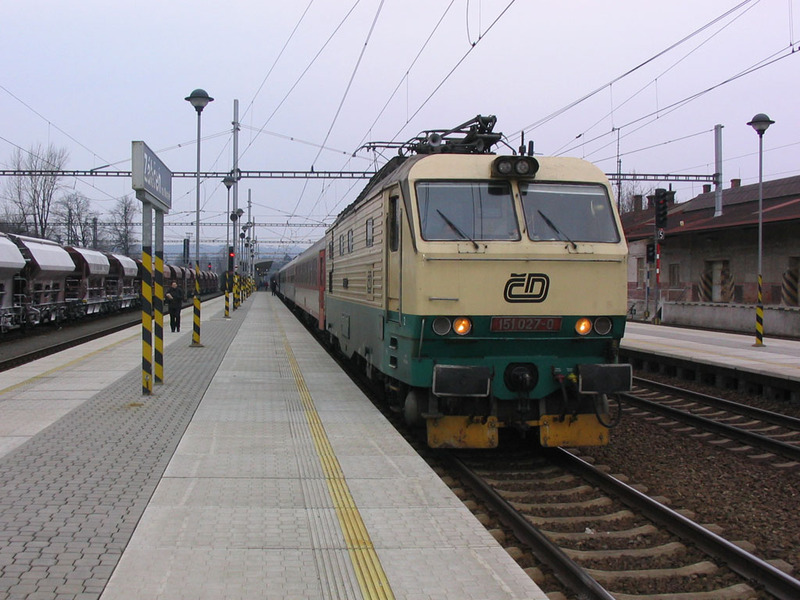 810 233 and its trailer, forming train Os20007, wait at Techonin for Os20010 to pass on its way from Stity to Letohrad. Out on 0714 ex Pardubice – IC583, same stock, same buffet car attendant, same table, same loco (151 027), opposite direction! On time at Zabreh but then it all went horribly wrong. 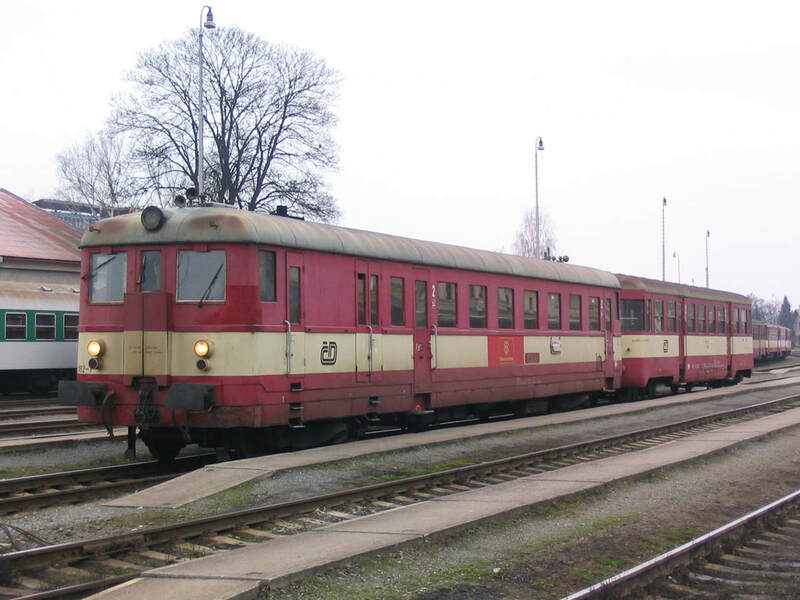 R909 to Jeseník was reported 90 late so we elected to change the plan completely, starting with Os 13014, 0827 to Šumperk, formed of new a new ‘Pacer’ (814). Šumperk is being refurbished and has no buffet, no waiting room, … Anyway, on to Olomouc then, on Os 3624 via line 290 (831 182 and trailer, with a kindly conductor lady who stabled our lunch in the back cab so that it wouldn’t dissolve in the considerable heat of the main saloon). A long wait at Olomouc punctuated by Kozel dark and Gambrinus, then on to EC107 with 151 014 to via the down Přerov avoider. After a short but luxurious ride in a German built (I think) open first to Hranice, it was back to an Os hauled by 163 249 to Valašské Meziříčí. Thence to wheelie bins, with 810 445 to Veřovice, covering the ‘bustitution’ stretch to Hostašovice which we missed last August. Supplies of Radegast were taken on at Veřovice (no standing around in the warm sunshine as in last August!) before joining 810 151 and trailer to Studénka where I was hugely disappointed to go into the main line platform. This seems very hit and miss – there’s a loop on the main line platform where the wheelie bins can run round, which may have a lot to do with it [i.e. perhaps you’re more likely to do the bay platforms if you’re on a single 810 with no trailer]. Certainly ours was booked back to Veřovice from P15/nastupiste 4 which is the separate ‘station’ south of the main line. The connection on to Ostrava-Svinov was suitably graffiti’d – you’ve guessed it, 460 016. It’s still a mystery to me why these units catch all the graffiti when almost all other ?D stock escapes. Just because I don’t like them… Duly Radegasted in the Svinov station buffet we continued on double deck ‘City Elefant’ (honestly) unit 471 025 which was working Os 3423 1716 to Český Těšín. Daylight was way beyond technical when we did the ‘down’ flyover at Chotěbuz but hey, it’s only half a flyover. The evening concluded with a walk over the northernmost of the bridges to Cieszyn and a meal in a Polish [surprise, surprise – it’s in Poland. Not sure why I found it necessary to record that a Polish town had Polish pubs in it] pub followed by a visit to a four-ale bar to try Warka, a pleasant enough Polish beer. The restaurant had Brackie, a Cieszyn brew and highly unmemorable. The bottled version sampled last August was much better. Return to Czech was via the other side of the bridge where you troop through the Czech immigration building. Ludicrous but true – had some locals not pointed out the error of our ways we’d have stayed on the same (Polish) side that we went out, and had a shouting at. Ridiculous. [But rather 'charmingly' Cold War, what with the steel bridge, the lights and the barriers so that cars can’t bunk through. (2018 update - all gone now, even the steel bridge, replaced by a concrete one and with Schengen, the border controls have gone too)]. After a successful start with IC583 the day went a bit pear shaped due to late running and we ended up at Šumperk waiting for 831 182 to take us down to Olomouc. Breakfast proved to be chargeable, and rather expensive pro rata. However the whole thing at under £30 for a double wasn’t bad (Hotel Central). Christmas music at breakfast late in February was perhaps a little odd though. On to the station for IC 548 to Petrovice u Karviné (via the tricky curve), there to become EC 108. Haulage was 362 174; a passing freight with a Slovak 131 provided a good photo opp. Shame about the light. A bit of microgricing as we did (slowly) the up goods line from Louky nad Olší to Karviná-Darkov, the passenger line being rusty and with some bits of OHLE missing. No moleworks were in evidence. Round the curve successfully to Petrovice u Karviné which cleared the map for south-east Moravia. We arrived in the westernmost platform at P.u.K. and acquired 151 011 to take us to Ostrava. 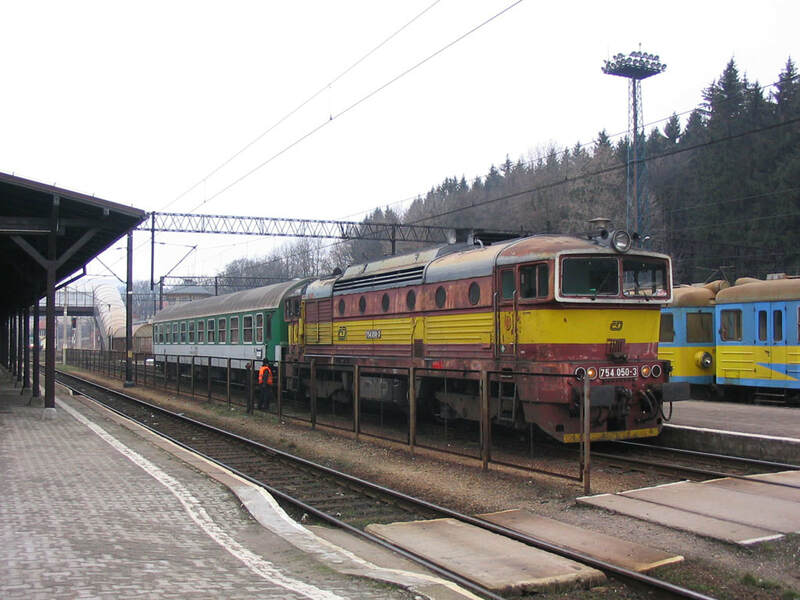 The portion from Krakow arrived behind PKP’s EU07-117 and was (presumably) gronked on to the rear as the Český Těšín portion didn’t move until departure. Phew. In to Brno via Blažovice and the ‘northern’ route. PR spotted the Jihlava train (R666) in the bay as we came in and a quick if illegal dash over a barrow crossing had us seated at 13:25:30 (13:25 booked departure) with 754 046 leading. Recent snow and low cloud made for a murky climb up to the summit at Rapotice where we waited to cross 854 222 which was working Sp 1663 Jihlava – Brno. ‘R’ trains don’t stop at Studenec so we had to change at Nam?š? nad Oslavou to the following Os 4814 with 754 041. At Studenec the Křižanov service was waiting (810 123) so we had to pass up the adjoining Litovel pub. Quite slowly over the top to Křižanov but unfortunately still foggy so there’s not much to report! On time arrival at K?ižanov though, with a 5 minute connection to Os 4608 for Žďár nad Sázavou, hauled by rusty electric 242 210. Dead on time at Žďár gave an easy if short connection (4 min) to Os 14878 for Havlíčkův Brod, 230 072 hauling. Impressively punctual again at Havlíčkův Brod which gave Mr R time to hurtle off for a couple of bottles of Rebel before the 1712 to Pardubice. This is a through train from Jihlava and seemed to offer a good chance of the northern route out of HB. So it proved – 854 206 appeared with two trailers, leaving little choice as to route! Darkness fell at Hlinsko after we’d admired the huge sawmill operation at Ždírec nad Doubravou. Although we got to 6 minutes late at one point, by the time we’d done the reverse at Pardubice-Rosice nad Labem to get down to hl.n., arrival ended up just 1 minute late after a day that would never have worked in the UK. Breakfast at the Hotel Labe is now waitress served, and no longer features orange juice! At least we had time to get fed before walking down to the station for the ‘Košice Kippers’ (and cars), 0716 to Kolín and Praha hauled by 162 054. First class was almost full (shock, horror) but we managed to find seats for the half hour to Kolín. Onwards from Kolín on R670 to do the freight line to Praha-Vršovice (needed the up side of the flyover, see) behind 363 108. Once that was done, there remained little else but to get back to the airport (usual C, A, 119), let BA get us to London, and wait a few minutes for the grubby but efficient Purple Parking to take us back to Bull’s Bridge to collect the Tractor for the drive home. I was still trying to maintain a reasonably methodical approach, so in May I went back to the Czech Republic to fill in a few more gaps on the map.